A former chief of the Federation of Sovereign Indigenous Nations says too much power in an organization that has lost its focus is one reason why internal matters escalated to the point that the Saskatoon Police Services had to be called to FSIN’s office in late September. 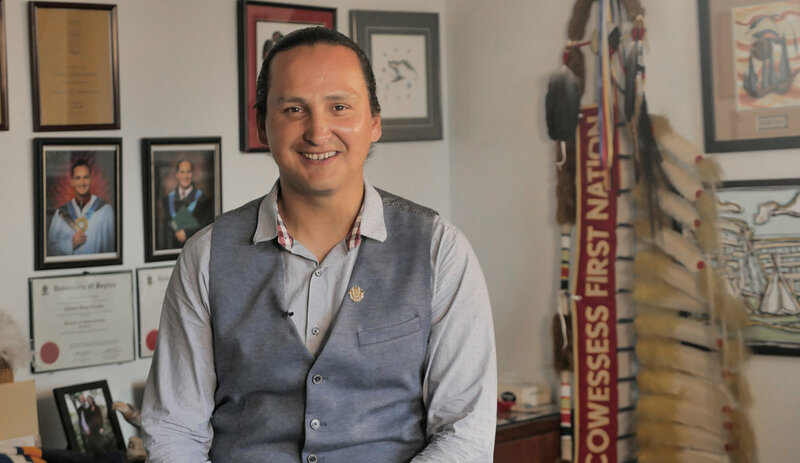 “I think frustrations build when leaders effectively can’t come together and articulate their relationship and their role in the advocacy group,” said Guy Lonechild, who served as FSIN chief from 2009 to 2011 and is now chief executive officer with the First Nations Power Authority. With three of the five executive positions, including that of the top chief, up for election in October, two competing sections in the FSIN Election Act caused a dispute over who would serve as interim grand chief. One section gave interim leadership duties to the first vice-chief, Kim Jonathan. Another section gave the executive member whose position is not open for election, Vice-Chief Heather Bear, those same duties. Jonathan was locked out of the chief’s office and the police were called to the FSIN headquarters. While Jonathan is not seeking re-election, her position of first vice-chief is on the ballot, while the position of fourth vice-chief is not. The decision was made, said Lonechild, for executive operating officer Dawn Walker to deal with FSIN’s administrative duties until the Oct. 25 election. Lonechild believes that the FSIN has strayed from its website tagline of “protecting inherent and treaty rights,” a role it’s undertaken since 1946. “It’s lost that path and it’s become more about money and control, rather than the core mission of what it’s fighting for,” he said. Lonechild points to the institutions that now fall under FSIN’s umbrella, including the Saskatchewan Indian Gaming Authority (created in 1995), and the First Nations University of Canada and the Saskatchewan Indian Institute of Technologies (both founded in 1976), as muddying the waters. “There’s a lot at stake when you become leader at FSIN. It has so many institutions itself. I know that when I was chief of the organization, we tried to look at depoliticizing those organizations,” he said. Over the years there has been controversy with the institutions. One such example was in 2005 when FSIN vice-chief Morley Watson, who also sat as board chair for the university, fired two administrators and suspended another after an audit. More faculty and staff were fired or quit over the next few months. Lonechild also notes that over the past 20 years funding has been more readily available to organizations to deliver services so the FSIN has gone in that direction. “It’s almost like it’s an organization that is maybe too large and too bureaucratic and maybe there’s a need for transformation of the organization itself,” said Lonechild. He adds that since he got out of politics, it’s become clearer to him that FSIN has lost its direction. “I’m disappointed and disillusioned like many people across the country about FSIN,” he said. Cowessess First Nation Chief Cadmus Delorme doesn’t share those sentiments, but he does agree that changes need to be made at FSIN. The necessity for change has been underscored by the recent infighting, he said. “We manage poverty, we manage economic growth as chiefs and when we’re provided another challenge created within our own lobbyist groups, some chiefs just prefer to stay home. Some really drive and try to fix it. Some are status quo. It’s just a whole spinning wheel. It just has to be revamped,” he said. Chiefs choosing not to get involved, he adds, keeps the same chiefs elected over and over again in executive positions for FSIN. Bobby Cameron is seeking a second term as chief. He was first elected to the FSIN as second vice-chief in 2011. He was re-elected in that position in 2014. A year later he became FSIN chief in a landslide victory. His challenger is Thunderchild First Nation Chief Delbert Wapass, who once served as third vice-chief with FSIN. Dutch Lerat, who is seeking to retain the position of third vice-chief has had a long history with FSIN. He was first elected in 1984 and served for five consecutive terms as second-vice chief. He was elected as third-vice chief in 2009. He is being challenged by Little Pine First Nation councillor Christine Jack and Beardy's and Okemasis First Nation teacher Corey Bugler. Running for first vice-chief are former FSIN chief Morley Watson and former Kawakatoose First Nation chief Darin Poorman. Poorman has run for the position unsuccessfully in the past. Delorme says David Pratt, who was elected as new second vice-chief in 2017, has been a “breath of fresh air.” Pratt won his position the same time Bear was re-elected as fourth vice-chief. Delorme suggests a governance review is in order since one hasn’t been undertaken for over 10 years. The FSIN is not a rights holder nor a government, he stresses, but an advocate group. “We delegate responsibility to the FSIN to help us with giving interpretations to the rights agreement,” said Delorme and he wants to see more of that. He points to the federal government’s 10-year funding agreement and says Cowessess First Nation could use support from FSIN in determining the “pros and cons” to such an agreement. “I have a lot of hope and faith in the FSIN. I think we’re going through a learning phase and I hope we learn from it instead of repeat it,” said Delorme. FSIN did not respond to a request from Windspeaker.com for comments.